Learning how to find fish on a new lake is really an art that can be learned. The best way to do it is simply to go to unfamiliar lakes at different times of year and try to figure out what the fish are doing. Every lake is a little different. Some of them will have shared tendencies, but they are all still a little different. I love going to a lake I haven’t fished much, finding an area that looks like something I’ve fished successfully elsewhere, and putting the trolling motor down to figure it out. 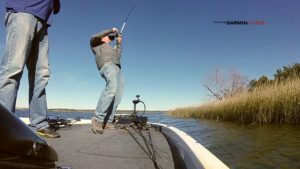 Usually, when you fish a lake you haven’t fished in a while, it takes time to figure out what the fish are doing, and your day might not be as productive as a day on your home lake, or one you know exactly how to catch them on. 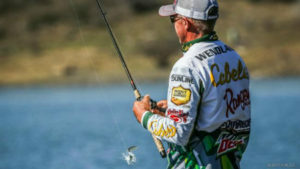 So as you practice the art of finding fish on less familiar waters, you may be giving up a great catch on your home lake for a tougher day of problem solving, but if you want to get good at finding fish, in my opinion, this is the best way. In anything, the way to get better is to stretch yourself. Best of luck out there! 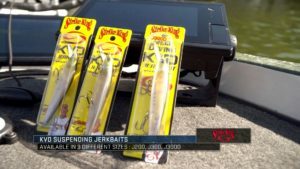 It’s the Time of Year for Jerkbaits! One of my very favorite ways to fish in the pre-spawn in lakes that have clear water is with a jerkbait. Either over grass or on rocky shorelines, a suspending jerkbait, when fished properly can yield some great catches. First, it’s a slow technique. Usually, you make a long cast and your cadence is the key. Normally, I will go with twitch, twitch, pause – twitch, twitch, pause, with the pause being longer the colder the water is. With the water temperature in the low 50s or high 40s sometimes the best cadence is very, very slow. My favorite bait right now is a Strike King KVD J-300 Deep. 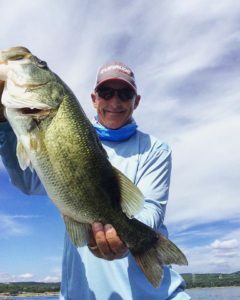 This bait will get to about ten feet when fished on ten pound fluoro, which is right in the area where a lot of bass suspend this time of year. Bass like to suspend on vertical rocky banks, channel springs, around trees, docks or over grass. Sometimes the pause may be for up to 20 or 30 seconds, which is very slow, but you just have to let the bass tell you what they want. For a rod, I like a Cabela’s XML Bass Jerkbait/Topwater Rod. I’ve come to love this rod for throwing either a jerkbait or a topwater. It is light and will not wear out your forearm, elbow and wrist. If you get to a lake this time of year with clear, cold water, think about throwing a jerkbait. Where to Start When its Cold? When the weather starts getting colder and water temperatures drop, the first thing I do when I put my boat in the water is look at my Garmin 7612 to find where the bait is and what the topography looks like. A lot of times in this cold weather, fish will come out of the creeks onto the main body of water and suspend, so you will want to concentrate on fishing stuff that is vertical, fishing baits that work vertically, like a jig and spoon, something that will work up and down, or fishing a jig very slowly. 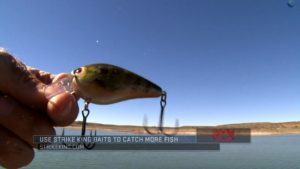 Or if your depth finder tells you the bait is suspended, often the bass will be suspended, and you can catch them on a jerkbait or maybe a tight wobbling crankbait or a swim bait that doesn’t have a lot of action. It will be a little trial and error, but understanding what bait and bass do when the water is cold is key. 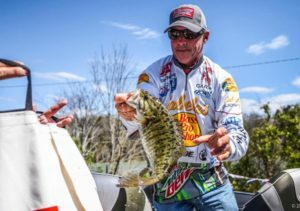 Throwing a crankbait in the winter months can catch a lot of big fish. The key is you want a crankbait that does not have a lot of wobble to it, something that runs really tight. I like to throw a Strike King Lucky Shad this time of year. It can go anywhere from four to ten feet, depending on the line set up you have and it has a nice steady retrieve. This isn’t a bait you crank real wildly, just make a nice steady retrieve. When fishing like this, you’re looking for stretches where fish can suspend, sometimes bluffs, sometimes rocky. And I like to use a light crankbait rod because these baits can sometimes be pretty heavy to throw. 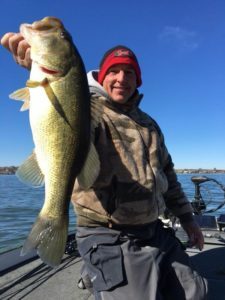 Enjoy these cold fishing days and catch a lot of bass. The dog days of summer will be here before we know it! One of the best ways to fish during the winter months is to flip mats or matted vegetation. Often and on many lakes, instead of heading out deep when the water gets cold, bass will snug up under the canopy of matted vegetation. I flip this type of cover with an ounce and a quarter Strike King Tour Grade Tungsten. heavy weight to be able to punch through the vegetation. My favorite bait to use is a Strike King Rage Bug in Green Pumpkin. It’s a small compact bait that you can rig totally straight, and I really like the Owner Jungle 4 oz. hook for this set up with a bobber stopper on top and a heavy weight line. The key to fishing this bait this way is to make repetitive pitches into the mats. Pitch it on all sides of the mat, cover it fully and then jiggle it so it can get through and free fall all the way through. It’s a total reaction bite, so you want to be sure to let it get all the way through the canopy and to the bottom. Then when you get it in there, yo yo it up and down, fishing it slowly. This is a great way to catch some giant fish this way in the dead of winter. Good luck! I’m a power fisherman, and one of my very favorite baits to power fish with is the square bill crankbait. The one I throw probably more than any other is the KVD 1.5 Square bill. As far as colors go, I usually like something in a shad color or chartreuse or sometimes crawfish. These baits are extremely versatile. It’s a bait you wind pretty fast because when you wind it, it actually moves back and forth and doesn’t track perfectly true, but that is part of what makes the bait really good. Square bill crankbaits also come in lots of different sizes depending on how deep you want to fish. It’s an extremely versatile bait, and during the fall when they are keying on shad, it’s a must-throw. 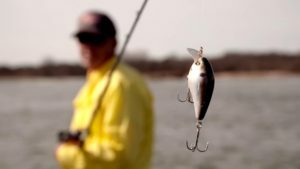 Choosing the best line for topwater fishing can be a difficult proposition. There are several ways you can go, and each one of them has its benefits and drawbacks. The old standby is monofilament. I like Sunline Defier mono, usually in 17 or 19 pound test. Mono floats, it does not backlash badly, and it’s easier to cast, especially when you’re in a hurry. The drawback to mono when fishing topwater is the extra stretch and it can be more difficult working your bait from a long way away. The other way you can go is with braided line. I prefer Sunline SX1 35 on 50 pound test. I also use 65 pound test when throwing a frog. 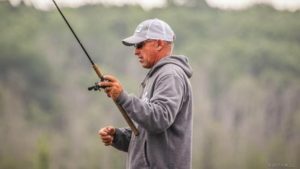 Braid has no stretch, and it can be easier to work the bait, and it’s often easier to extract fish from hang ups with braid. The drawback to braid is castability – it’s just not as easy to cast, especially when casting in a big hurry like on schooling fish. The other thing you can do is to put a monofilament leader on braid. This is an option I use quite often when throwing a prop bait, a popper or a walking bait. It is probably my overall favorite way to fish topwater. My leader length is 7-8 feet and I end up retying the leader knot about once a day. The bottom line on fishing line is that it’s really personal preference. You just have to get out there and decide which one you like the best.